(Wired) -- One of the challenges for the newest generation is how to gain fluency in online networking without being able to draw on large, diverse social networks of their own. On Tuesday, Togetherville announced the open beta launch of a new online community for kids and their caretakers. The site brings parents into the same virtual space as their children to help them mentor kids to be good digital citizens. "We built Togetherville using the spirit of the neighborhoods most of us remember when we were kids," said co-founder, CEO, and parent Mandeep Singh Dhillon, "where everyone knows everyone else and watches out for each other. In Togetherville, parents have peace of mind that their kids are playing with people they know and trust and kids have fun while learning the tools they need to become good digital citizens." Fully compliant with the Children's Online Privacy Protection Act (COPPA), Togetherville is intended for kids who are too young for Facebook, officially, but have parents immersed in that culture. The 6- to 10-year-olds are invited to engage with their real-world friends, play games, watch videos, and create art. Grownups act as the gateways for new contacts, assuming the responsibility for inviting other families to join each child's online neighborhood. Experiencing online networking together, grownups can guide their kids through the age-appropriate content in an ad-free environment. The project was developed by people trained in child development, learning, and online safety. Developers worked with officials from Connect Safely and the Family Online Safety Institute to include the social and technical activities that serve as the core competency for online interaction. Three key areas -- self-expression, entertainment, and education -- are emphasized. "Togetherville is social-networking training wheels for families," said Anne Collier, co-director of Connect Safely. "It models safe social-Web use for kids and shows even parents who are already keen Facebook users how social networking works best in the family context." My 10-year-old son gave the site a test drive after the private beta opened up to the public. He's at the top side of target audience for Togetherville, already well familiar with Facebook, Twitter, blogging, and creating YouTube videos. His literacy with social networking sites is strong, but his strong social connections remain firmly offline. 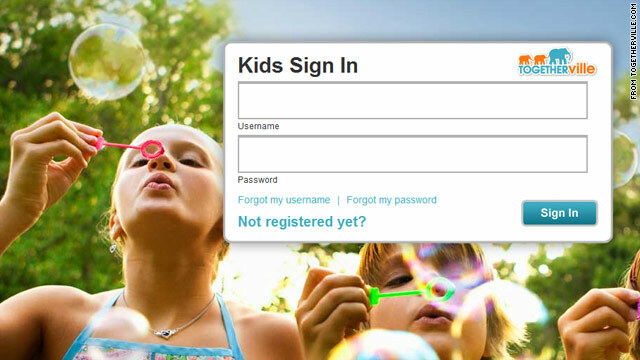 The signup, initiated by a parent, uses Facebook authentication to verify the adult's identity and leverage his or her existing social network. The parent then creates accounts for each kid, customized with a photo and name that reflects who they are in the real-world. To increase accountability and trust in subsequent interactions, anonymity and pseudonyms are discouraged. The accounts are verified via e-mail to ensure that the kids are firmly tied to the grownup's online identity. One strength of the site -- moderated content -- is also a potential drawback. There are numerous Quips and Comments from which to choose, but they are all canned responses approved by Togetherville administrators. The few opportunities to freely create text require review and acceptance by staff before they will appear on the site. This was a turnoff for my son: "It's like they are saying that kids don't have the ingenuity to come up with their own posts." The grownup's experience centers around managing the parameters of a child's neighborhood. Their profile simply shows the associations to other kids, and content contributions are largely in support of kid activities within the site. The favoriting mechanism in Togetherville -- a "trunk" -- can serve as both a digital memory book and a monitoring tool to see what kinds of important items float to the surface. For adults, activity can be piped into their Facebook news stream to share with friends in that environment.